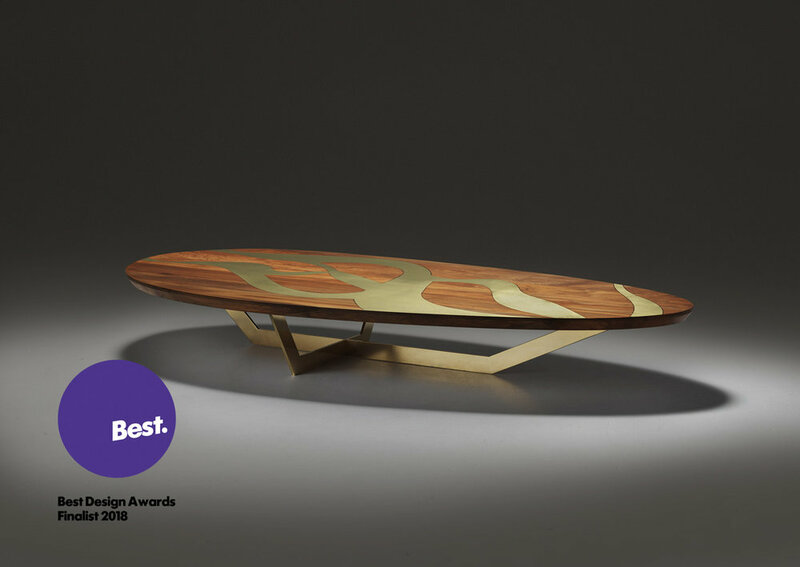 The Flow Side Table - The Flow Collection 2018 finalist in the Product Design category in the Best Design Awards 2018. Excellence in design. Good design hits you in the heart. How you feel about an object and therefore how you engage with it is connected with the design, with the care with how it’s been put together, with the thought and effort that has gone into its creation. It’s a subconscious experience – when good design is doing its job, it leads our experience in ways we don’t even realise. With good design we are driven to touch, to feel and sometimes to own the object because we’re intrinsically attracted to it. We love it. We love where it has come from. The ReLeathered Sideboard - The ReLeathered Collection 2018 - the use of used leather black belt was a big part of this collection. Each belt tells the story of a New Zealander, this collection is rich in meaning and has a unique story. As consumers, when we first see something, we don’t look for any of its manufacturing history, for its fabrication, for the HOW it’s been made. Most often we look at WHY. And at LyZadie Design Studio, the simple reason we make bespoke, handcrafted pieces is because we are able to pour love and attention into each one of them. So in each of our designs, the why we make it shines through. We also have a unique story to tell, that of an island in the Pacific, called New Zealand. Unique is what we love and cherish in our creations and what we want to share with you all. The White Cloud Pendants - The White Cloud Collection 2018. The story of this collection started by the inspiration of the other name New Zealand is known as: Aotearoa - The Land of the Long White Cloud. In our design process we start with the story. There is something we want to say with each piece. A story about New Zealand, about the place where we live and grow and breathe. We want to highlight the area the timber comes from, we want to showcase the vibrant beauty of natural water formations, we want to illustrate the power of New Zealand’s ever-changing landscape. This is our WHY. This is the heart of our design experience. And we like to think this attention to illuminating our place and people and reason for making is what drives others to love and cherish our work. The spark of the story that will come alive in our design is an idea, a feeling, an element of New Zealand we want to highlight. With that spark we move to the drawing board, letting the idea spread out over paper as we sketch out the lines and form of the design by hand. There will be many iterations of that initial spark, but only some of them make their way from the drawing board to the next stage. Working in CAD refines the ideas into creations, into real objects that already have a tangible life to them. This part is so exciting. Seeing an idea come to life in front of us, knowing that as we work with crafts people to bring the different elements of this idea to life, we all get to share in the story from whence it came. We work collaboratively when it comes time to transform our designs into reality, and having ongoing relationships with some of New Zealand’s most talented and creative craftspeople is a founding tenant of our business. Using bespoke techniques, artisan tools and sheer innovation, our artists are a big part of what makes every design from LyZadie Studio not only truly unique, but also true to its initial story-spark. It can take months of work, trailing materials and techniques before we settle on the final form of the design, a true orchestration of minds to bring the original spark to life. 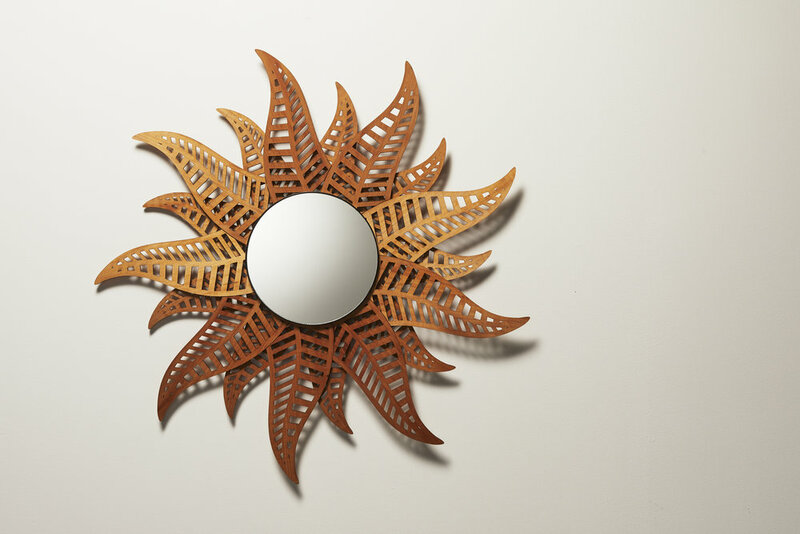 The Wooden Fern Mirror - The Fern Collection 2018. Handmade in reclaimed Kauri. The choice of material was intrinsic to the ethos of the designer Lyzadie and the makers - Multiverse Designs. What’s more, everyone we work with shares a belief in conscious design. We are committed to using sustainable materials and practices in our products, ensuring they add healthy elements to your home, rather than taking away from it. And because our makers are true believers too, everything is made to last, made locally, made with the sustainability of the planet in mind. In each creation we think of the materials we are going to be using - Is it biodegradable? Can you recycle it? Will it last a long time? Is it healthy for the maker and the user? Is it bringing beauty in people’s lives? Is it enriching people’s lives? How can we use technology and new materials sustainably in our creations? That’s all the questions that come up every time we create a new product. When we are recognised for this passion in our design process, it means so very much. Within our first year of operation we’ve been featured in numerous magazines, showcased at the Design Show in July 2018 and most recently, have been finalists in The Best Design Awards 2018. We’re over the moon with how things have gone. That our Flow Collection has been recognised in this way is something we could only have dreamed of happening so quickly. And when we look back at why The Flow Collection has proven so popular with design experts and collectors alike, it’s become increasingly clear that the heart and passion our team pours into each of our pieces is the reason they shine. We love creating beautiful bespoke pieces. We are passionate about working with others who share this focus. And we hope that in everything we do, we continue to be able to showcase the tangible quality that design can bring to the imaginations and lives of all who touch it.